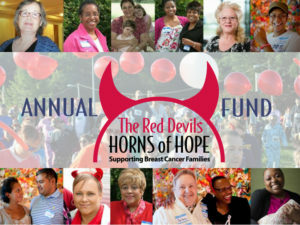 Thank you for your contribution to The Red Devils will make an immediate and profound impact on the lives of Maryland families living with breast cancer. Help us care for women living with breast cancer so that they can enter or continue life-saving treatment. Your most generous gift today is an important step in our raising $250,000 in 2019 to care for more than 800 patients. Will your employer match your gift? Click here to DOUBLE YOUR DONATION.